Twenty-five years after the fall of the Berlin Wall and the Iron Curtain, Europe has grown together. Countries which didn’t even exist as independent states back then are now member states of EU and NATO. The European Union reaches all the way to the Gulf of Finland and the Black Sea. Erasmus students move around all of Europe to study party. Trade is flourishing. The European Union wins the Nobel Peace Prize. So everything is great, the continent united, with freedom flourishing everywhere? Unfortunately not. Because in one important aspect, Europe is still divided into east and west. Like the erstwhile Iron Curtain, there is a line across Europe, beyond which civil rights are not well respected, where people are treated worse, and sometimes suffer right-out abuse, because of their personal characteristics. The rights of homosexuals, the great civil rights issue of our time, separates the continent like freedom of the press and freedom of speech once did. ILGA, the international association working for equal rights for gays and lesbians, bi- and transsexuals, has published an index showing the implementation of equal rights for homosexuals (as of May 2013). Within Europe, the east and the southeast of the continent clearly have some catching up to do, even among countries within the EU. My own experience in Lithuania confirms this. Germany has an average rating, which is not exactly anything to be proud of when comparing it with the other western EU member states. This entry was posted in Europe, Family Law, Human Rights, Law, Maps, Politics and tagged gay rights, ILGA. Bookmark the permalink. I’m glad that the UK is at +77%, still trying to work out what the -33% is though… as the map is for May 2013 do the recent new UK gay marriage laws add up to 33%? I’m not surprised that Italy is in the teens at all. Convict Berlusconi has promoted sexist, racist and homophobic TV for over 30 years. Some young Italians have never known anything else. On top of corrupt polittcians don’t forget the Church, religion just doesn’t poison gay rights, it poisons everything! I never thought I would see Malta overtake Italy on social issues in my lifetime. But it just did. Yeah, I would have really thought Italy would have been in the green. Same for Finland, but they do have two neighbors that are green and the other is in the red. But Monaco on the same ranking as Moldova? I would still take 19% of Bill Gates’ portfolio over 100% of mine. But there you have different bases. 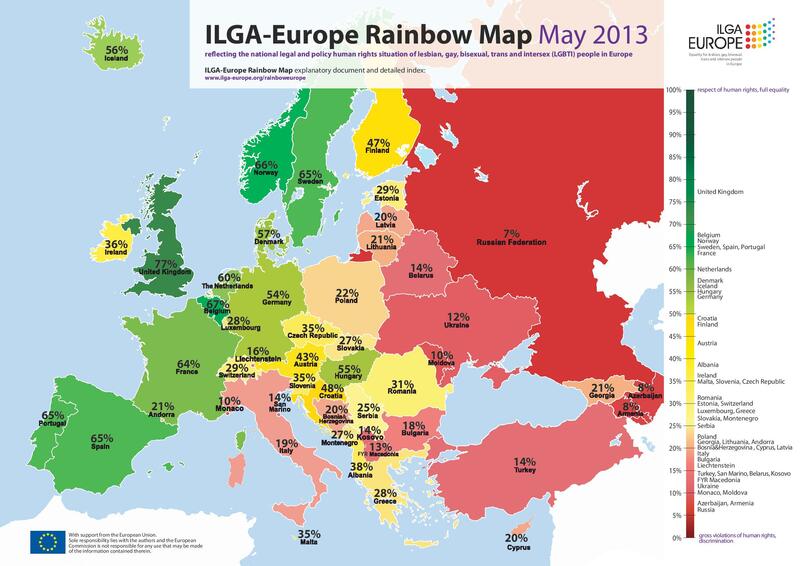 – In the case of the ILGA index, the base is the same: total equality for gays, lesbians and transsexuals. It’s not like the 19% are 19% of what is possible in Italy. They are 19% of what is the maximum possible, period. The legal situation is dire there, but in daily life homosexuality is quite accepted. Some say it’s even a kind of Mecca for gays. Interesting map, but it would be even more interesting to compare it with the numbers of 10,20 or even 50 years ago. As in – what is the (long term) trend? Are there changes for better or worse and how fast are they?